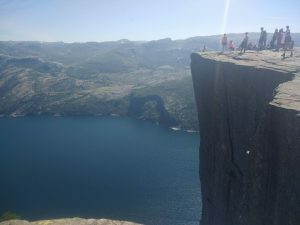 Home to Bergen – Do your dream! Seems an age since we talked about getting up to the arctic circle, but at last, we’re on our way! Many things delayed this trip but as its such a long drive, we’re glad we’re now in a small, new and reliable, and fuel frugal van! However, a couple of days in and even us, the seasoned travellers, have a few issues. Firstly, my new polaroid prescription sun glasses are great. However, we only put them in the van for this trip and the polarisation conflicts with our phones – so the screen its 100% black in landscape! Very annoying, as can’t see to take photos, and importantly as we use the phones to run TomTom – I can’t see the satnav!!! Grrrrrr. And secondly, the 12v van laptop charger is playing up and its impossible to get a specific 12v charger when in this neck of the woods. Oops. And thirdly, Mel broke her sunglasses, and “cheap” ones here seem to be £25-30. Apart from that, 885 miles since leaving home, we’re almost at the starting point of entering Norway. The van has been flawless so far, comfortable and 51-52mpg to get us almost to the tip of Denmark, and that’s fully loaded with 40L water and enough food and wine and beer to sink a ship. Though hopefully not the next ferry! After crossing Harwich to Hook of Holland, we overnighted at a stelplatz north of Hamburg and slept like logs. Then just headed north into Denmark and, TomTom being amazing, routed onto backroads to avoid motorway incidents. We stumbled on a parking area in Aabenraa (no – the band wasn’t from here). But rather nicely, it had a beach area and café and a reasonable relaxing place to have a picnic lunch. Then just north, via Aalborg for a look around (nice quay/uni area and town) to an overnighting place at Bronderslev convenient to get to the ferry the next day. The ferry we’ve chosen leaves from Hirtshals to Kristiaanland and it’s a fast cat doing over 40mph. the sea was millpond smooth (phew). Before we left, we walked around the quaint/quiet Hirtshal town where we’ve been before, but also explored the Bunker Museum which was part of Hitlers Atlantic Wall. 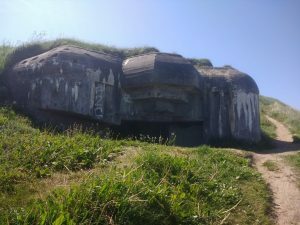 Loads of bunkers and paths to explore and interesting to see the defensive efforts made. We like Denmark. Its nice. Its pleasant. But that’s about it – its not exciting enough to entertain us for long. And so to Norway, our first new country of the year, and first impressions are the south was like a cross between Switzerland and the Ardeche area of France. Getting out of the ferry was busy, so we hope to find the quieter areas the further north we get. But clearly the Germans and Dutch seem to be motorhome mad, and I guess this large concentration is why there are loads of signs in quiet areas that are anti-campervans. 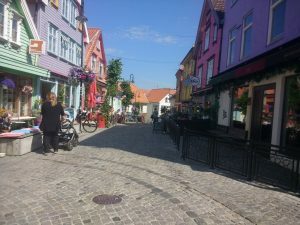 We visited Stavanger which is pretty busy and a bit of a dead-end, and it was OK for a wander but not worth a massive detour especially as traffic was a mare. 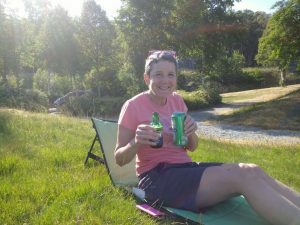 And from there, continuing North towards Preikestolen, overnighting in a lovely spot next to an inlet, very quiet and sunny with great views and cold beer! 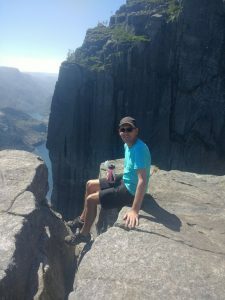 The road to Preikestolen has been recently remade and is now 2-way and easy and you are forced to use the parking area at the end of the road @ 200 NOK (£20 ish). Ouch. But I guess that also pays for the road and the like, and actually for the views and the pulpit rock itself its worth it. A challenging walk (moreso than the mileage suggests, our calves reminded us for days) leads to spectacular views of the landscape as well as some good photo opportunities. (Pulpit Rock is seen in the latest 2018 Mission Impossible film). From there we use a free garage service point to empty waste and fill tanks and headed north, and took a “short cut” over the mountains rather than stay on the main 13 road. In our van, fine, bur in big beasts beware! 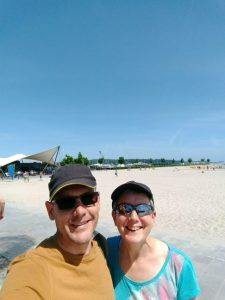 We had fun and the views were great and we ended up back on the 13 through many km of fjord-side roads and tunnels to Nesflaten which kindly provides a parking area next to the Fjord with good facilities. Continuing north (as we will for many weeks!) our next big stop is Bergen, but going up the 13 still we opted head more towards Voss and then head West towards Bergen, a long way round but we wanted the sites and to skip the ferry. Pretty much, there is one road, and today we got passed by an ambulance, fire engine and police car, and yep – an accident that blocked the road. So we had an early coffee break, but the road cleared quickly and we continued. Has to be said, the Norwegians know how to build tunnels and bridges, and the route was technically superb – coming out of one tunnel straight onto a suspension bridge and straight into another tunnel, and this route had 2x roundabouts within the tunnel. Very impressive addition to a fun route with waterfalls and great views throughout. What wasn’t so impressive was the automatic toll billing us 150NOK (£15) for the fun of it. These seem to be in random places and we clocked up £25 on tolls today and don’t quite know why but the bill when we get home may be rather large. Fuel is reasonable (£1.35/L) so comparable to UK. Food though, we were warned, is hideously expensive – around 3-5x UK prices. Bread £3, can of Pepsi Max £1.30, cucumber £2, and sweets scary, and 10 pack of 440ml lager are around £25! 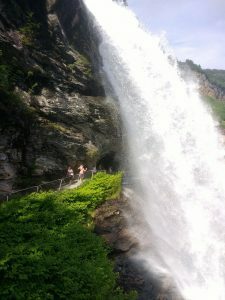 After getting some salad bits (think high-quality rib-eye steak price equivalent) we left towards Norheimsund where there is a large waterfall you can walk behind. Yep. You can. But not as impressive as it sounded. Then towards Bergen overnighting in a quiet marina on another fjord ending week 1 and 1330 miles. Hi, What type of vehicle do you choose for NV200 when you buy the Ferry tickets? I know it can fit in car dimensions but I am not sure? I priced up car/camper/MPV and gave dimensions where needed, and from memory saw no difference. I know I called up one of the ferry companies and they didn’t seem bothered. So its gone on as camper (if same price) or car/mPV if cheaper. Never got a second look.